It’s summer, you’re talking to a friend on the phone and end up inviting them over for a BBQ that night. Now what? You’ve only got a few hours and you’d like to serve something nice… But you need something quick – and preferably, well not cheap exactly, but not expensive. That’s just what happened to me a couple of weeks ago and after spending some time on the computer I came up with several easy, fast, uncomplicated and healthy dishes to make on the grill when your time is limited. I saved the recipes l so I can refer back to them the next time I get into a time crunch for dinner and I thought I’d share them with you. Everything here is cooked on the grill. There’s grilled drinks, appetizers, main dishes, veggies and side dishes and even desserts. Pick one or two from each category and there’s your easy, healthy and pretty inexpensive grilled meal fit for guests – or just the family. Or save yourself the $45 and use the method in this video. 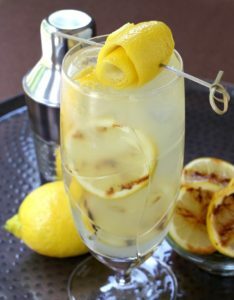 Start off your BBQ with some summery grilled cocktails. You usually don’t think of cocktails when you think of cooking on the grill. But when you grill fruit the flavors intensify, the natural sugars caramelize and they get even sweeter and juicier. And fruit with grill marks look great as a garnish. These are two of the easiest appetizers on the internet, if you don’t count opening a bag of chips. For the Grilled Cheese Wheel you put the cheese on the grill to warm it up and toast slices of bread. That’s it! The Bacon-Wrapped Sriracha Asparagus is great as an appetizer (cut the asparagus in half to make it more bite-sized) or as a side dish. Put them on the top rack of the grill to prevent flair ups from the bacon grease. Or you can put them in a disposable foil pan to cook instead of on the grate. 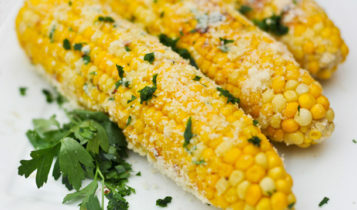 Fresh corn on the cob is only around for a very short time every year. Eat it while you can! If you want to save a couple of minutes grilling time on the sweet potatoes, you can parboil them ahead of time and then finish them up on the grill. I can personally vouch for both of these recipes. 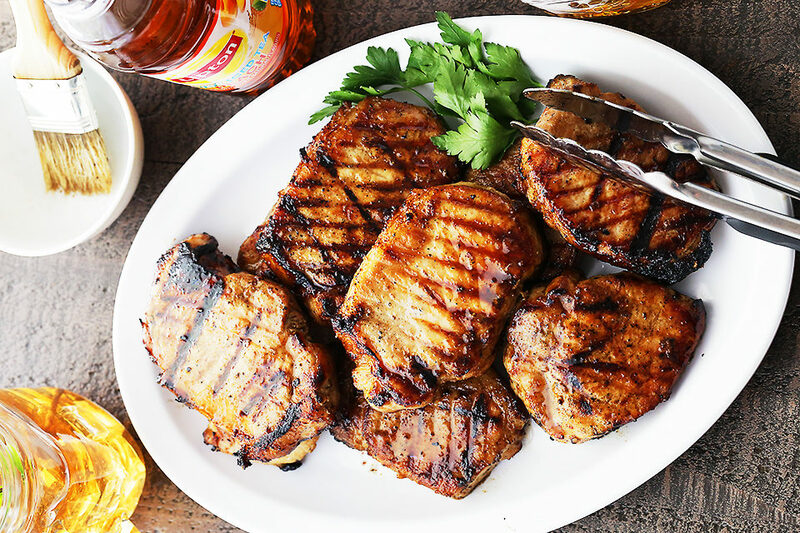 I used 1 1/2″ thick chops for the Honey Soy Grilled Pork Chops, which turned out so juicy (I brined them first) and flavorful. The Chicken with Balsamic BBQ Sauce was delicious. I made it last summer so I don’t remember if I brined it first, but it was good. And if you prefer beef to chicken, the Balsamic BBQ Sauce is great with steak too. Whenever you make chicken, pork, turkey or shrimp, especially when you grill them, brine first if you can. Brining keeps the meat juicy. When you brine the meat it absorbs 6% to 8% more moisture, so you’re starting out with a juicier piece of meat. You’ll still lose moisture as the meat cooks but since you started out with more moisture than usual you’ll end up with more moisture than usual. There’s usually sugar added to the brine solution too but sugar doesn’t have anything to do with adding juiciness. That’s what the salt does. The sugar adds flavor and also helps to brown the meat as it cooks. Rinse the meat off after brining and dry well. If you’re going to marinate now’s the time (use a low or no-salt marinade recipe) or just cook as usual. 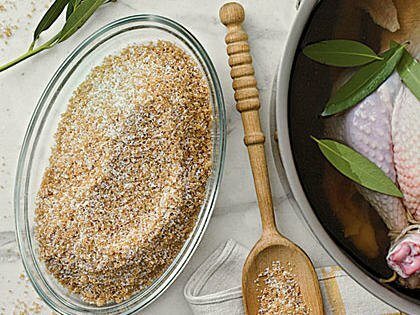 Want to find out exactly how brining works? Then read this article by Cook’s Illustrated, The Science of Brining. Here are two perfect ways to end a meal. I’ve made the Toasted Pound Cake with Mascarpone and Amaretto several times. 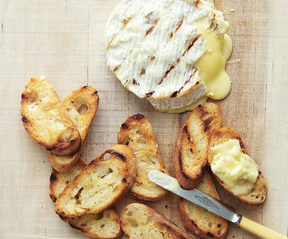 It’s light and creamy and so simple – but so impressive. The flavor of the apricot preserves and Amaretto together is amazing! And the prep work takes, literally, a couple of minutes. 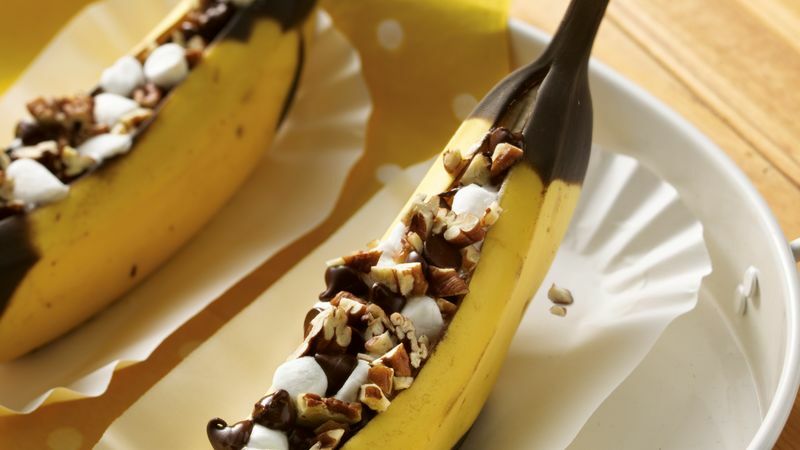 Grilled Banana Boats – Surprise everybody with this cute and different dessert. What’s there not to like about bananas, chocolate, marshmallows and pecans? It would be good with a scoop of ice cream too.